I didn’t start out as a natural when it came to DIY projects in my house. Back then, I would sometimes hastily tackle projects on the weekends when my kids were out of town. 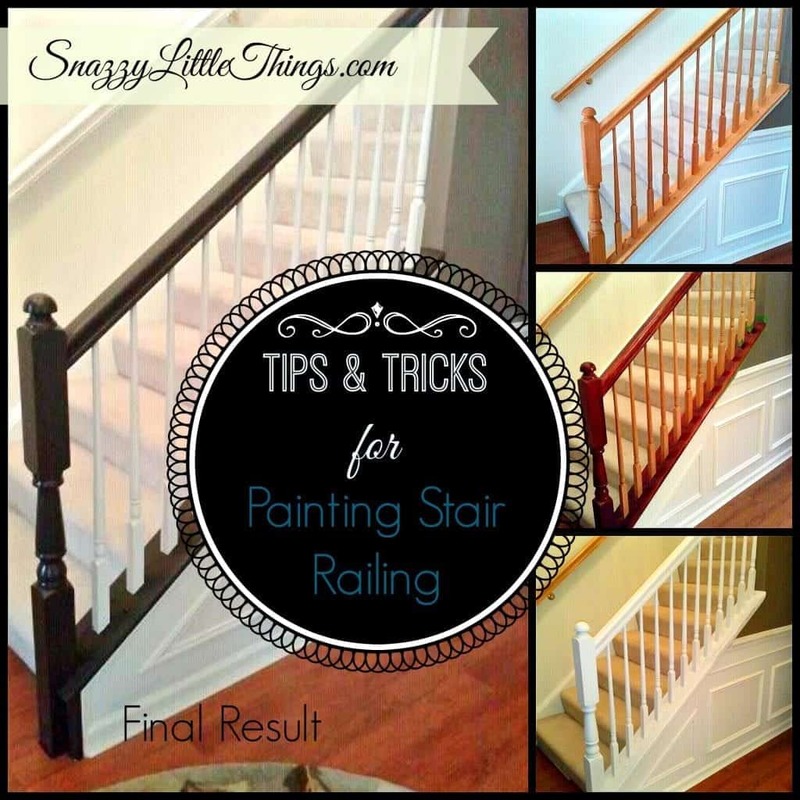 The painted stair railing was one of those hasty projects. I didn’t exactly know what my style was back then. My decorating skills were still in the development phase. 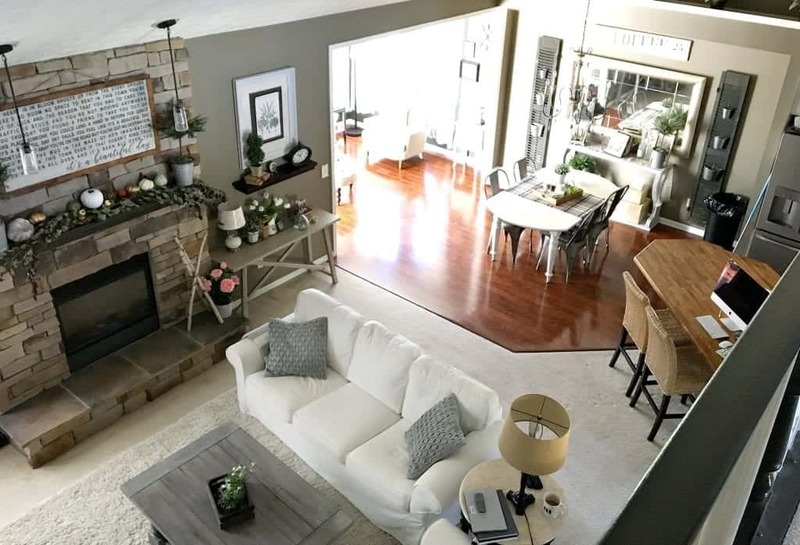 While I feel like I have been working fast, it took a slow evolution (and lots of yard sales and purging of our excess stuff) that brought me to how my house looks today. Getting back to the stair railing makeover, I hadn’t updated the entire house yet. I tried to step outside of my normal comfort zone and “warm up” my color scheme by bringing out the reds in my flooring. It turns out I didn’t go in that direction and warm colors just didn’t work. 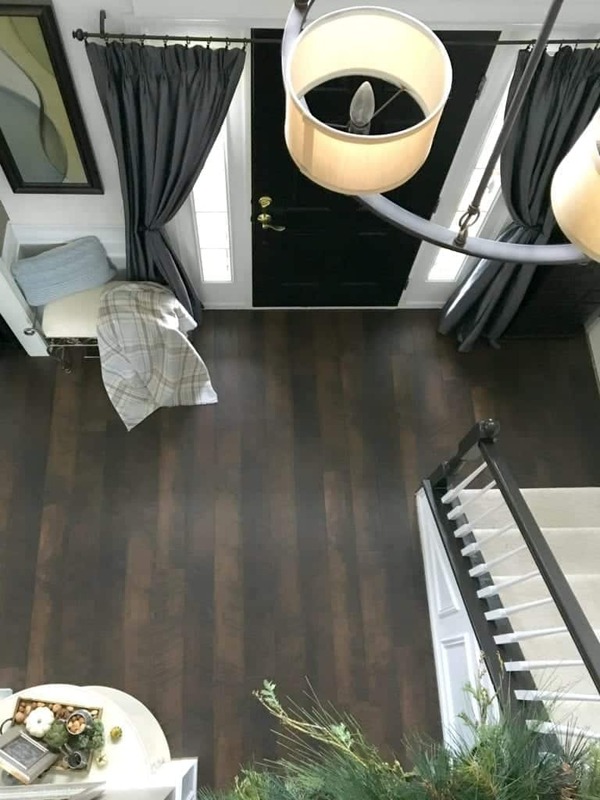 (And I later changed out our floors for a dark walnut). My house had builder’s oak–everywhere! And when I say this, I mean that orangey oak that came standard with houses. I lightly sanded the railing and got started (be warned, that was my first mistake). So here is my first iteration of trying to “warm up” my house with reds. Yes, I applied stain…on top of stain. Just. Don’t. Do. That. It took about 2 days to dry. You read that right…two days! Once it was dry I really wasn’t sure if I liked it yet. Doing it correctly would have meant completely stripping the wood before the wood would accept stain – and who wants to do that?! *smirk* Yes, cutting corners wasn’t the answer. And I was in a hurry because my kids were out of town and I wanted to get it done quickly. Ok. I hated it. I got some opinions…and they said the same. *Sigh* Time to start over…white primer is good for that. (I almost stopped here and left the primer on permanently). Once I fixed that I proceeded with the rest of the loft railing. And of course, I continued updating the rest of the house. Hence…the blog. 1) Prime First if you plan on painting your railing a solid color (which is what I ultimately did after making several mistakes). 2) Strip the wood if you want a natural wood finish and don’t want a solid color. But be warned, lots and lots of work involved with this step. It is likely that a stain won’t perform well on an already finished wood. Godspeed if this is the route you choose! 3) Get Opinions on Color…First. To be honest, I get so impatient when I have an empty house with no kids, so I get a little overly ambitious and just start painting. I’m a much more seasoned DIY’er now…so…lesson learned. This is a process that requires planning. My other issue? I’m fairly desensitized to subtle color differences (you can test your own color acuity in this test). So I should have talked this one through with someone that sees color much better than I. 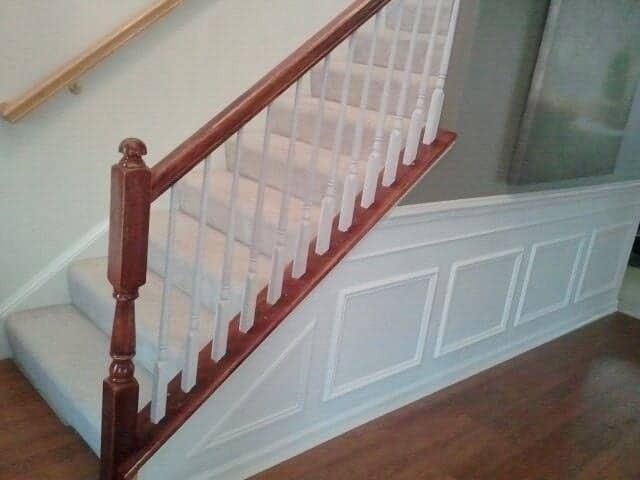 4) Tape off the balusters and railings to prevent mess. 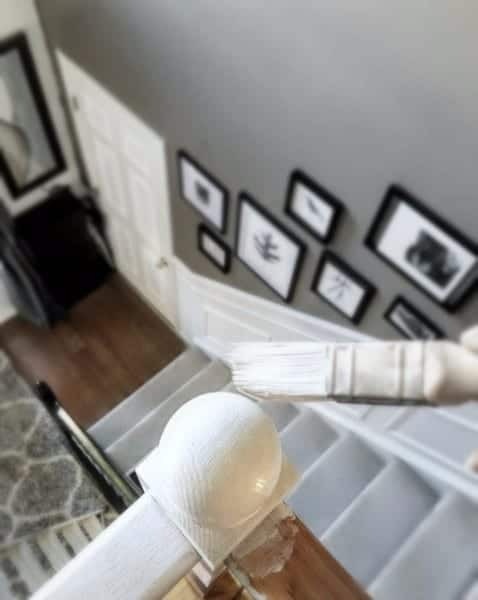 5) Use artist brushes in tight areas and hard to reach places– especially for finishing the underside of the handrail. Oh I love the final look! I have the white in my house, but think I may need to add some contrast now. Fantastic post! 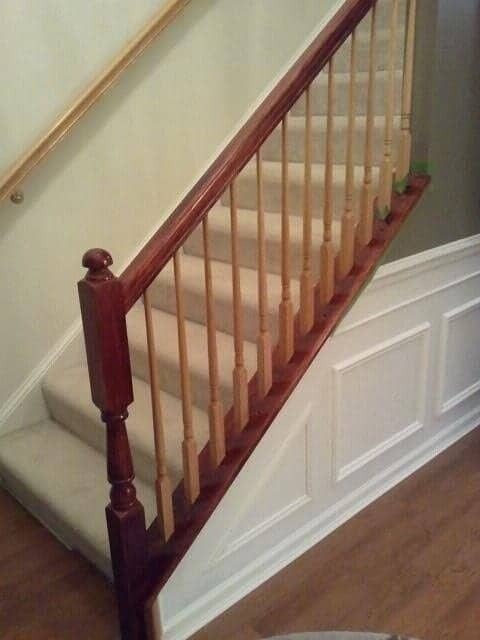 I *JUST* had a discussion with my hubby today on how to fix up our stair railing- he told me it couldn’t be done and we’d have to replace it all. Really?! In my opinion, where there’s a will there’s a way! (I happened upon this post while reading another one of your posts on stenciling a kitchen backsplash…. I think it was meant to be!) Thanks for sharing this! Shannon…..see? this is why we blog. 🙂 We help SETTLE those arguments right out of the gate. 🙂 I’ll be even more of an instigator….I tend to start those ‘impossible’ projects when my better half is at work ;-)…yes this project can be done!! Good luck and check in often! 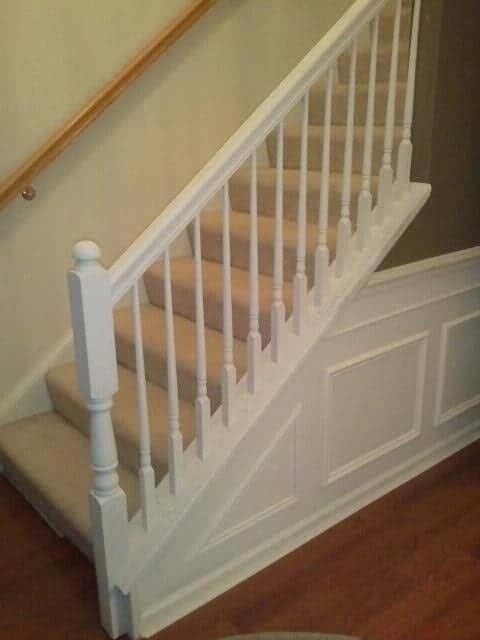 Can you tell me what the paint colors are on your handrail? Love love love it..doing mine tomorrow & would love to do mine the same way..Thank you! 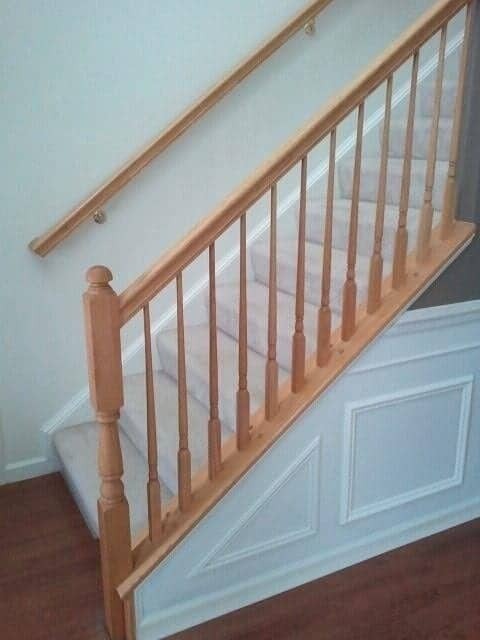 So I have the oak finished railing as well and will be going white…. So u don’t need to sand? If you prime it you won’t need to sand. If they are very glossy you may need to use a deglosser as a first step. I hope that helps! What color paint did you choose to use? It is so hard to choose a dark espresso color!!! Thanks! Turned out great! Jessica I will email you also to be sure you receive this. Here is what was on the paint can: The dark brown paint color is called “Fired Earth” Valspar Interior/exterior High Gloss Enamel Gloss Base 4 222151, 101-8? ?, 109-40.5, 113-1Y13, 214-1Y32. (wow, paint is complicated!!). It goes on very dark…nearly black so if that makes you nervous maybe try a sample of a couple of dark browns before you commit. HI Karen! 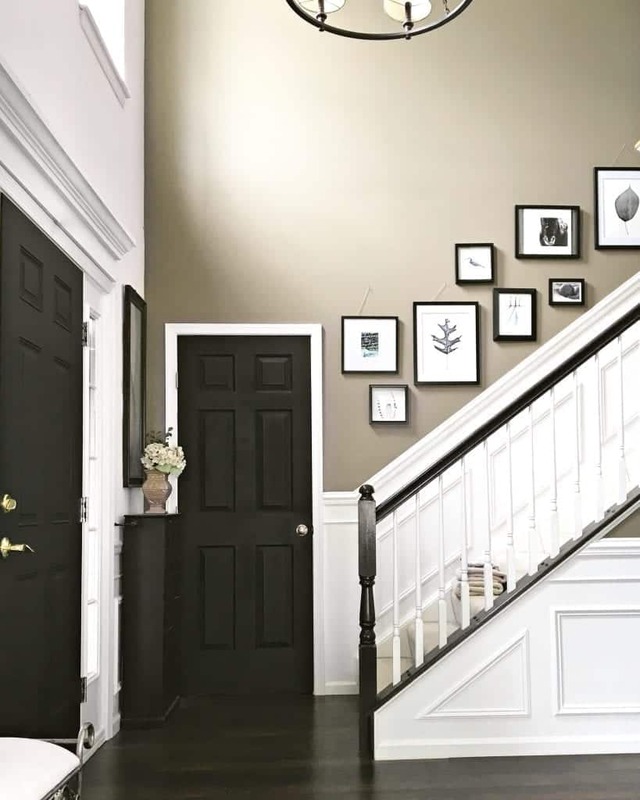 I will also send you an email to be sure you get this: The dark brown paint color is called “Fired Earth” Valspar Interior/exterior High Gloss Enamel Gloss Base 4 222151, 101-8? ?, 109-40.5, 113-1Y13, 214-1Y32. (wow, paint is complicated!!). It goes on very dark…nearly black so if that makes you nervous maybe try a sample of a couple of dark browns before you commit. Did you not have to sand down the wood at all? 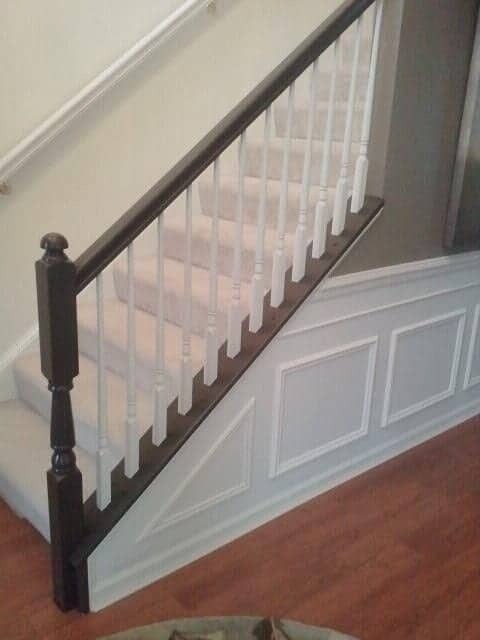 We are looking to paint our banister a darker color, but aren’t sure if we need to strip off the coating and sand it down first or if we can just paint straight over top of the existing finish? How has this held up over time. Thanks!!! What color did you start with? Dark or the light?